I am not keen on Halloween but I think I will a do a few spirited looks without going scary. The first is a simple, fast dry brush. I sometimes use a fan brush instead of the nail polish brush when I want a more precise, detailed look. I can add more colors and they look better on my shorter nails. I use polish directly from my work space without thinning it down with acetone. This is a very simple technique that dries quickly and is easy on the wrists. I work the fan brush gently across the nail, both horizontally and vertically, until I am happy with the final look. The bottle gets the sunlight in the photo but the nails are all color accurate! I hope you like it! 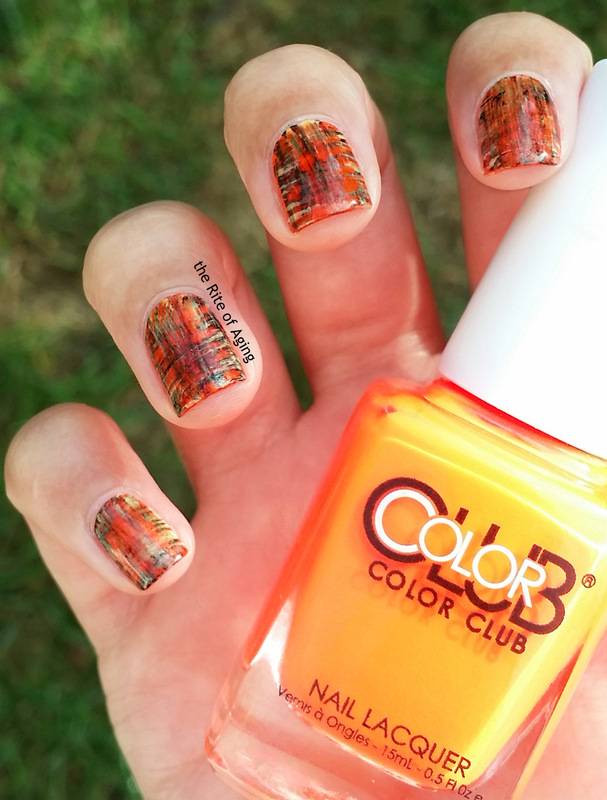 Base: Color Club Wham! Pow! Thanks Rebecca! I prefer the fan brush because sometimes I get too thick a look with the regular nail polish brush! I love this look! It’ so in a fall mood!